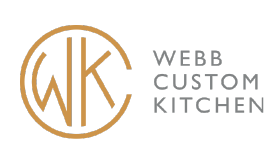 Webb Custom Kitchen is a fast moving place, with all the ebb and flow that one would expect from an award winning high end steakhouse. But above the hustle and bustle of the open air kitchen rests a unique monument. It is the head of a Sphinx, which watches over diners and drinkers as they enjoy their meals. This guardian comes with an interesting but tangled history. It is a history intertwined with the Webb Theater, the silver screen, and Gastonia’s Hollywood dreams. Long before the Sphinx was born, a house owned by George Alexander Grey spread across several acres of land. After Grey passed away, his land would become the center of downtown Gastonia. Some of the land on which Grey’s mansion rested was purchased by J.E. Webb. Webb was a local Golf Pro who financed and built three Webb Theaters. One theater was built in Shelby, another in Kings Mountain and the only surviving one, on south street in Gastonia. J.E. Webb employed the noted Gastonia architect, Hugh White to build his movie house. It was White who envisioned a theater in the “Art Deco Modern Style” which would allow for “Talkies” as opposed to the silent films of the previous decade. It was also White who envisioned the face of the Sphinx, which would sit atop the center of the proscenium arch. White decorated the theater in accordance with the popular Egyptian revival style. The discovery of King Tut’s tomb in 1922 had a profound effect on architecture, awakening a fascination with the eternal in the American population. White drew this artistic movement to give the Webb Theater a touch of the foreign and the mysterious. So carefully, the Sphinx took a place high above the proscenium and watched quietly as the show went on. Beneath his chin the screen caught the light of projectors and celluloid for decades. In 1933, during the Great Depression, the theater and the Sphinx found a new caretaker in William Conn. Conn updated the audio and projection performance of the space and purchased the Linnebach projector that sits in the lobby to this day. Conn worked for 18 years, day and night to bring film to the families of Gastonia. The Sphinx performed his task from 1927 until the theater closed in 1951. The theater was sold to R.L. Baker of Hickory, who was forced to close due to operating expenses. After the Webb theater closed it became the property of the city, and for a while it was rented out by various offices for various things. The Linnebach projector and some old black and white pictures of the theater remained in the lobby, as a reminder of what had been. The Sphinx and the proscenium were painted over, perhaps waiting in the sands of time. 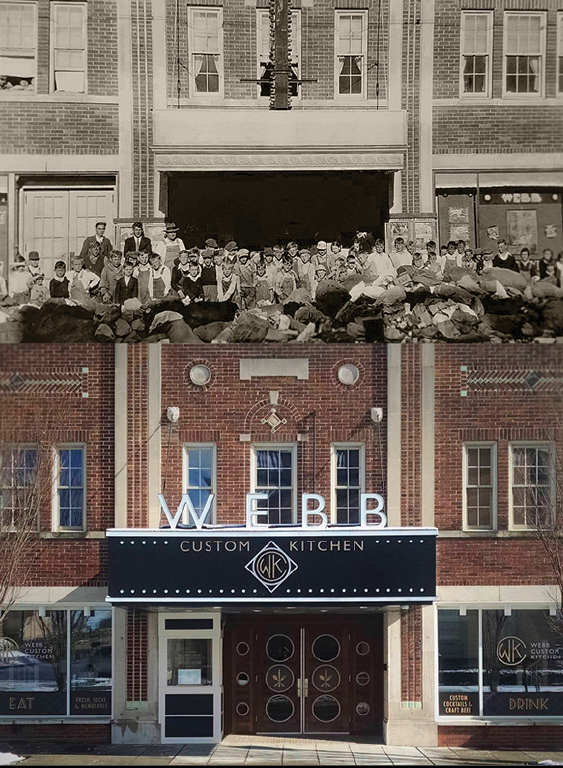 It seemed to the residents of Gastonia that the light of the Webb theater was extinguished forever, despite the public desire to restore the space. In the 21st century a small attempt was made, the building was bought only to became a tap house, but that endeavor eventually ended in bankruptcy. But, in 2015 the building was purchased by Jim Morasso. With a passion for both food and films Morasso saw the potential of what the Webb was, and what it could be. So he set out to create something wholly unique, giving the Sphinx and Gastonia an opportunity to shine again. Morasso realized the survival of the Webb couldn’t rest on history alone. So, he re-envisioned the Webb Theater as a high end eatery that would pay homage to the building’s theatrical roots. Morasso sought the help of Executive Chef Jon Spencer, who would later go on to become his business partner. Spencer drew upon his knowledge as a certified executive Chef, and set out to create a menu both as appetizing and adventurous as the greatest action movie. Together, Morasso and Spencer traveled the country inspecting potential beef producers, poultry producers and vegetable producers to guarantee the least amount of chemicals with the greatest amount of flavor. While creating the space, Morasso found old film reels still sitting untouched in the projector. From these film reels he was able to produce a light box display that shows each frame individually. The color scheme of the restaurant developed into silver and gold, drawing one’s mind back to the bygone era of the silver screen. Morasso personally oversaw the rejuvenation of the interior, going so far as to hand paint the proscenium arch, and personally restored the Sphinx himself. Morasso approached the restoration with such a passion for the building and the history of the space that it drew the attention of the world renown photographers Yves Marchand and Romain Meffre. The French photographer’s work involved finding and photographing abandoned and lost theaters across the country, and showing the world what those spaces were, and what they could be again. 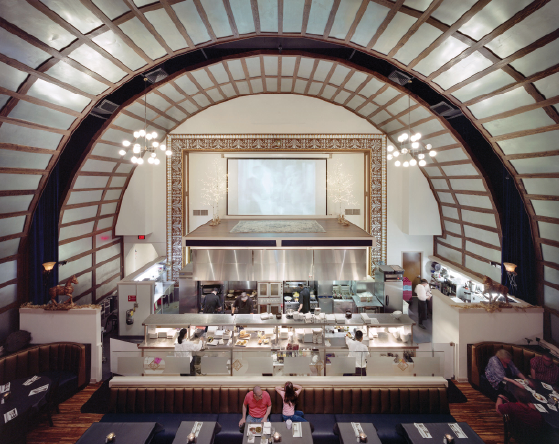 They held up the Webb Custom Kitchen as the ideal in how a lost theater could be found again. Today, The Sphinx enjoys a new Renaissance. Classic black and white movies still dance beneath him. The names are the same, starring Garbo, Dean, and Bogart. But, times have changed. The smell of the south bend broiler wafts upward, and the Sphinx’s charges enjoy artichoke hearts in olive oil, and lobster tails, as opposed to popcorn and candy. There is one particular picture of the Sphinx taken by Marchand, that stays in the mind’s eye. It is a perfectly centered look at the face Sphinx. The Sphinx which was recently completely restored by the caring hand of Jim Morasso. Amongst the red and gold one can see the eyes clearly. Its face remains stern and protective, eternal and seemingly immortal. But if one examines the eyes closely, it seems as though the eyes are smiling. If you would like to see for yourself, have an amazing meal and enjoy a magical night, then please visit Gastonia. The Webb Custom Kitchen is located only a few blocks away from the highway, between exit 18 and the turnoff to 321. The physical address is 182 South Street, Gastonia, NC 28052. Wine is half price on Monday’s and, drawing from experience, the drinks are never watered down. The staff is friendly and helpful, and reservations are available via phone or through the website.